We keep hearing news about war and bombings and disasters; about greed and violence and injustice; and the many forms the prevalent, agonizing lack of love in the world and the militarization of life get expressed. But outside the mass media we are told that things are evolving for the better, that awareness is rising and the planet is moving toward a higher dimension of tolerance and oneness. What is going on and how can you reach this wonderful, Garden-of-Eden-like dimension the New Age community is talking about, when you still witness so much suffering in the world? Someone recently asked me if moving to 5th dimension meant dying. It’s all very confusing! First, it’s important to understand that Creation unfolds in cycles within cycles; some are big and others small, like the gears of a finely crafted watch that keeps it all working in perfect synchronicity. 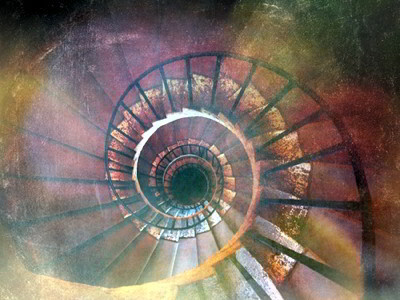 Within these cycles, Consciousness spirals upward, so when it completes a cycle it shifts to a higher phase to continue expanding. The transition toward a new feminine cosmic cycle, since we’ve reached the extreme of masculinity and going further would mean annihilation (this will be a 10,000-year cycle). The astrological Age of Aquarius we’ve been moving into for the past 200 years or so, but haven’t yet fully established (this is a cycle of about 2,150 years). And moving back to 5th dimension after falling into 3rd dimension more than 10,000 years ago. These are big transformations that affect everyone on some level, bringing up the worst and the best in humanity—the darkest cruelty and the most empowering idealism. We’ve reached the ‘thickest’ density of 3rd dimension, where the identification with the physical senses we call ego wants to play God, producing the technologies to manipulate and destroy life in the blink of an eye. The liberated teachers and saints of all times have said it innumerable times: to rise above your suffering you must cleave to the Divine—in any form you resonate with. The meaning of yoga is “union with the Divine,” so whether it’s through bhakti yoga (the path of devotion), karma yoga (the path of ego-less action), raja yoga (the path of self-discipline), or jnana yoga (the path of self-inquiry and philosophical knowledge), all paths lead to the same destination. No matter what culture or tradition, any spiritual path falls into one or more of these classifications. For instance, Buddhism follows raja and jnana yoga while Mother Teresa’s path was that of bhakti and karma yoga. Instead of focusing on what others are doing or not doing, find your path and immerse yourself completely until you tap into your own divine nature. This is what experiencing 5th dimension is all about, and such a deep internal transformation requires great self-discipline. Otherwise the density will pull you into chaos and overwhelm. We may recognize individual symptoms as the planet shifts into 5th dimension (see Main Symptoms of Ascension Into 5th Dimension), but we can’t expect someone else to do the work we came to do ourselves, at least not if we want to rise above the suffering we witness on a daily basis and contribute to a gentler, swifter transformation of Mother Earth. This is a subtle revolution of the spirit, and your individual transformation is needed to effect the transformation of the collective. To move upward and rise above 3rd dimension you must accept that the world as you know it is falling apart, and all the structures you’ve been relying on, to feel safe or in control, are crumbling under your feet. Because you can’t spread your wings and take off if you hold on to what weighs you down: your attachments, fears, unfulfilled desires, anger, resentments, judgments, and expectations. They all belong to lower dimensions of ego and fuel the suffering, injustice, and violence you see in the world. Let go of the belief that you’re unworthy of love. Drop all victimhood and assume spiritual responsibility for your life. Relinquish a spiritualized ego and be impeccable in thought, word, and action. Be humble and open to align with the Divine Feminine within. We all need guidance and support to find and follow our true path. Contact me today to get started with spiritual counseling and shed all the 3rd-dimensional stuff that holds you back and prevents you from experiencing a fulfilling higher purpose!